"WE GIVE SERVICE THE WAY YOU PRESCRIBE!" Prescriptions are our main business and we provide dedicated concern for every prescription customer. We are all about service, sales, and SAVINGS! At our pharmacy you are far more than just another prescription number, you are a customer friend that is relying on our over 200 years of combined experience to provide excellence in the preparation and delivery of your prescription orders. 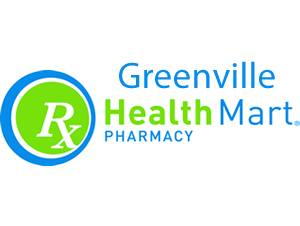 For well over sixty years Greenville Pharmacy has provided this quintessential example of excellence in prescription services. Prescriptions are our main business but not our only business. That's where the term Drugstore comes in to the big picture. At Greenville Pharmacy you will find that our Modern Pharmacy has an additional touch. It retains the charm of an Old Fashioned variety store that provides a mixture of the old with the new. A good example would be our friendly pharmacists who will give you a smile and a friendly personal greeting. Let's not forget our friendly store clerks. We call them the heart of the "front end". The huge variety of items includes over the counter medications, notions, grooming and beauty aids. There is a variety of candy, groceries, snack items. Radios and televisions, CD players. A multitude of nationally advertised gadgets to make life fun and easy. Do we have hair dryers? Yup, we sure do, and we also have fans and electric heaters too. Don't forget the milk.....yes, our drugstore has FRESH MILK! There is a digital photo service provided by a Kodak Auto-Kiosk. We have UPS package service, stamps, money orders, and printing services. Feel lucky, well don't forget to purchase your lottery tickets. There is lots more. Come in, if you don't see what it is that you are looking for we can more than likely order it for you. Now how is that for variety and service? Always a manager’s special just inquire as to what it is and receive 25% off!